IDC, short for Iron Deficiency Chlorosis, is a plant symptom which is caused by the inability to absorb iron in the soil, which leads to a reduction in chlorophyll production and ultimately reduced yield or even death. IDC symptoms are visible on plant leaves, where yellowing occurs in between the veins of the leaves, while the veins remain green. The common method to measure IDC is visual scoring on a 1-5 rating scale. Visual assessment or ratings are error-prone, tedious, non-repeatable due to inter- and intra- rater variability and not amenable to high throughput phenotyping – especially in the context of maximizing genetic gain during breeding. 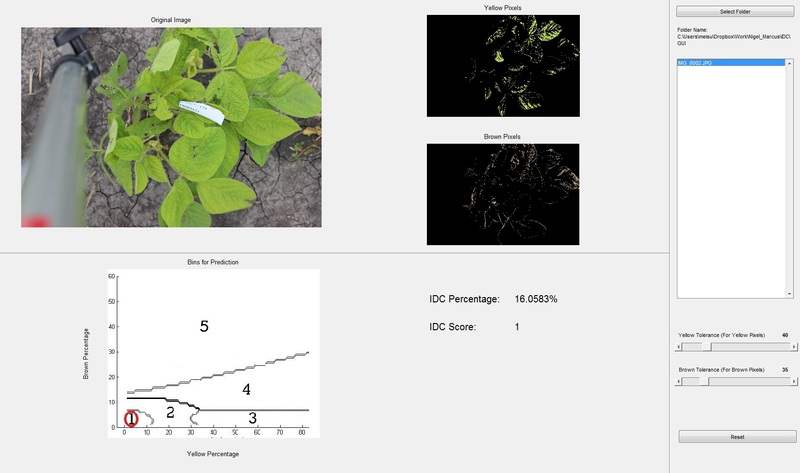 This has provided motivation to develop a new software framework using digital images to capture the IDC infected area upon the soybean canopy and subsequently predict the corresponding IDC score. image processing strategies are leveraged to identify the canopy, separate the canopy from the background, and remove spurious features from the image. The goal is to efficiently extract critical features (extent of yellowing and browning) that characterize the extent of IDC. Implement supervised learning methods (specifically, a Naive Bayes Classifier) to extract correlations between the extracted features and the visually rated IDC score. We integrate both stages into a GUI-based, user-friendly software that enables automated evaluation of IDC scores from digital images of the canopy. We showcase this software by extracting IDC features from a set of over 151 plants that have varying IDC resistances. This framework allows for a detailed, physiologically meaningful phase-diagram connecting IDC features (extent of yellowing and browning) with the IDC rating. This connection enables a more comprehensive understanding of IDC -related diseases and will provide essential information for laboratory experiments.